So far so good, I just moves in over the weekend and my family loves the community. We look forward to all of the great adventures and meeting our new neighbors. It was a good place to live for what I need it for. I wish it had a washer and dryer in the unit so I didn’t have to go somewhere. Also, I wish the apartment had lights in the bedrooms and living room. The staff is very friendly and helpful. I Love living here!! Staff, Maintenance so friendly. Quiet, friendly atmosphere. Maintenance always takes care of any issues right away. (Though I have only needed them a couple times). I have been here two years and am planning on renewing for another year. Check them out!! Great area and Community. Nice area. Maintenance is on top of everything. Everyone in the office is nice. Apartments are on the old side and things need to be updated but other than that so far so good. I've been here since November and I have thoroughly enjoyed it. Quiet neighborhood with friendly people. Staff is very attentive to needs as well. I love it! I am excited to be moving into the complex. I know I am going to enjoy the community and the amenities. I am excited about the nearby stores I can frequent. So far everything has been handled great by the staff at Sherwood station. They really do care for their residence and will work to accommodate your needs. The process has been easy and quick. I am really enjoying the location so far! I am right in the middle of everything and the staff is just amazing! For the price I pay, the size of the place and the location... you can’t beat it! i did not know if I would like apartment living since i had always lived in a single living atmoaphere. i am loving my apartment and the neghbors i have met. the staff and mainyence have been really nice and efficent. i would reccomend Sherwood Station to friends. i appresate the neatness and cleaniness of the grounds. I love the location, the size of the apartments is decent. I enjoyed coming home today to the upgraded bathroom lighting, shower head, and kitchen sink faucet change. I still have a hard time dealing with what I think is a 1960's maybe 70's stove, it only has one large burner & they don't sit right since I guess they don't make the parts for it anymore. I do also wish that they would power wash the windows that are on the high side where we are unable to. I do have to say that the manager is great & has always been very pleasant to deal with. So far my experience has been great! Great location, so far I feel safe! Close to schools and my job! Plus the space is just the right amount! Great community, convenient location to everything and a wonderful staff. The apartments itself are very spacious and different floorplans to choose from. Thank you for leaving a great review! We look forward to having you here for many more years! So far so good, I've only been living here a week... Nice and quiet as I have no neighbors yet...and the staff are very helpful and friendly!!!! I Wish they had a gym!!! Fantastic experience!! Qpartments pocation is very good and they are served by many grocery stores and clothing stores. Area is quiet and nice! Found this place just by looking at google maps. It was a decent lease and in a good community. We were able to move in right aways. The ladies in the office Paris and Ashley are awesome. I haven't dealt with Jennifer too much. The downside is the rent is a bit more higher than what I am used too and my unit is older. The windows leak cold air they all need to be replaced. I had to put up plastic on them. The appliances are outdated but are still working. I am not too enthused on what my power bill is going to look like. 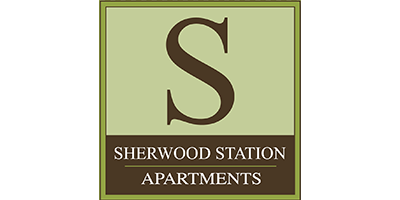 I Love living here at Sherwood Station Apartments. The staff is super friendly. Maintenance, although, I have very rarely needed them, are always quickly to respond. Great place to stay. I am definitely cool with staying here! Such a nice environment and my neighbors are pretty cool too! I would recommend anyone to stay here! I have enjoyed living her so far. I wish they had lights in all the rooms instead of having to buy lamps which was a pain when I first moved in since I only viewed the place online before I moved in. The complex is historically beautiful which warms me with comfort, making my home experience here the best. The activities available here a great and always feels welcoming; swimming was my favorite. I love the location and curbside appeal. It is very quiet and neighbors are so friendly, and the interior is nice and clean and appliances are always functional and clean. There are so many well-kept amenities to enjoy and the staff is the friendliest and most helpful that I've known so far. I rate this community a 5 firstly because of the staff. Everyone does their job and is very friendly. Second as I've stated before, I love the space of my 3 bedroom town home, you just cant beat that and the price is not to bad. I wish I could own it so the price amount stays the same every year, but that's everywhere you live that rents. Other than that I love the location and the neighborhood its self because the staff actually works as a community and is envolved by holding community events for us to attend, which is nice. Come join us when one is vacant which is very rare! Great community, great location. Close to shopping and highways. The apartment community has different events and gatherings throughout the year for the residents. Love it here bc it's so calm and quiet, nice neighbors, great office & maintenance folks and great location! Been here over 6 years, if I had a complaint it would be my appliances could use updating otherwise, I'm very happy here.